Scotland's best known outdoors man, Cameron McNeish, is celebrating the heart of Scotland. Scotland's best known outdoors man, Cameron McNeish, is celebrating the heart of Scotland. Travelling on foot, by bike, by pack-raft and with his beloved campervan, his journey takes him over 300 miles through some of our most impressive wild places. 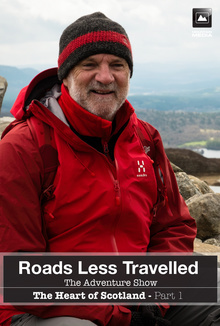 He starts in the whisky country around Ben Rinnes before heading over the wild Dava Moor and into the Cairngorm mountains and glens that have shaped his life. He finishes this first programme in the remote splendour around Loch Rannoch. Along the way, he meets scientists, historians and outdoor enthusiasts, and finds the only railway station in Scotland that hosts regular ceilidhs. Parts 1 and 2 in one package!